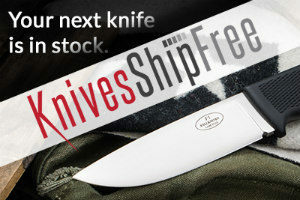 Combine a classic knife design with modern materials and you get my business every time. 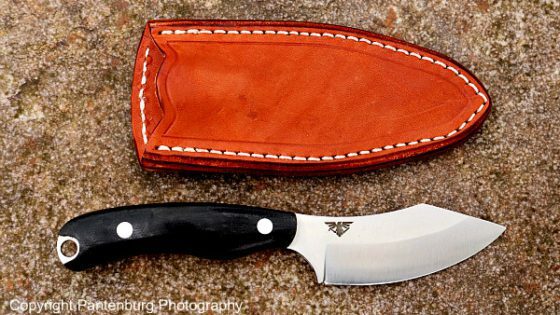 Bark River has done it again with this recreation of my first good sheath knife. Disclaimer: I didn’t get a free knife for this review. 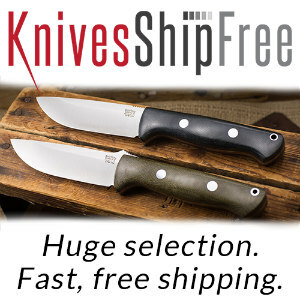 Knivesshipfree.com and DLT Trading are both Survival Common Sense sponsors, but neither company nor Bark River Knives had any input into this evaluation. All I ever promise is a fair shake. I made my first sheath knife when I was about 13, probably in 1965. 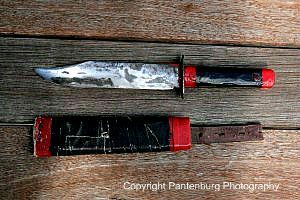 I worked for hours on a pedal-powered grinder to shape the blade into an imitation of the Marine Ka-Bar fighting knife. An avid small game hunter, I presumed that a big sheath knife with a six-inch blade would work great on rabbits and squirrels. Besides, if the Marines used a knife of that design, that was good enough for me. I made this knife and cardboard sheath 50-some years ago. The blade is quite usable and the sheath still does its job quite well! Turns out, it didn’t work very well at all. Most of my small game processing ended up being taken care of with my three-blade stockman pattern pocket knife. But I didn’t plan on staying in Iowa when I grew up, and knew I would need a 30.06 or .270 and a good sheath knife to move out west to hunt big game. 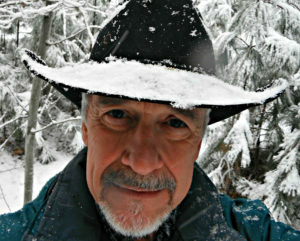 Who knows, I might even get a job to pay for my hunting adventures! Heber J. Ellsworth sent me this photo of an I-66 in his collection. Thanks, Heber! 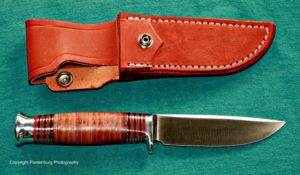 So I saved up and bought a Western I-66 sheath knife from Montgomery Wards, and I carried it for years. It worked fine for small game processing, but wasn’t as handy as my pocket knife. The Western went on my first western mountain backpacking trip in the Wyoming Bighorns in 1976, and it cleaned a lot of trout. As a fillet knife, it wasn’t the best, but it was real handy for gutting and beheading fish. The Western got lost about 1978 somewhere in Nebraska, and I always intended to get another. It is still on my shopping list when I go to gun and knife shows. The Manitou is good-looking and comes from a long line of workhorse knives. 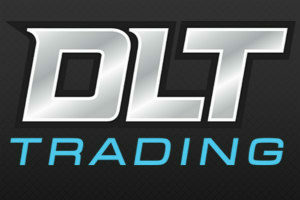 Design: This is a time-tested, classic design. Classic knives get that way because they work. This design has been around for more than 100 years, and if it wasn’t a good one, it would have been long forgotten. Grind: Convex is the best grind, IMHO, and all Bark River knives are convex ground at the factory. I’ve tried knives with several different grinds in the field, and convex always comes out on top. 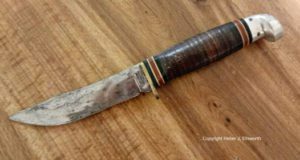 I recently had the scandi grind on my Battle Horse Knives Feather Stick re-ground to convex by Donovan Mitchell of Big D Knives. The improvement in cutting and slicing ability was dramatic. Steel: CPM Cru-Wear is new to me, so I will be checking it out. 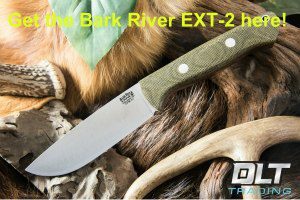 But I trust Bark River when it comes to blade steel. This steel is hardened to 60 HRC, so I’m betting it will hold an edge really well. I may have to dull the blade so I can see how hard it is to sharpen. Point: The Manitou has a drop point with a long swedge. 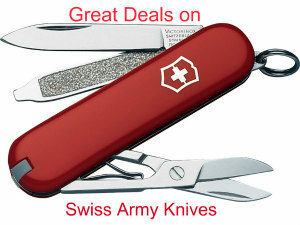 This is a great choice for a hunting knife. 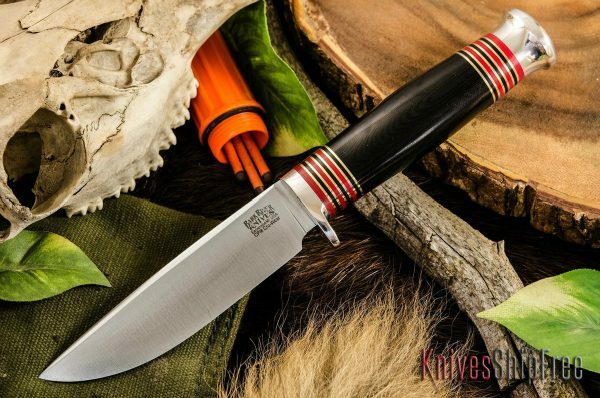 The point is thin at the end, making this a good knife for piercing, and doing the initial under-the-tail work when field dressing a whitetail or elk. 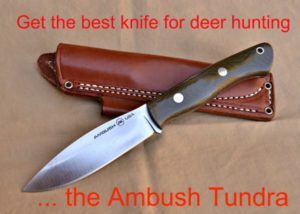 It will also work well for skinning around the neck and shoulders of a whitetail.The drop point is a good choice for a knife that will make that initial spine-down, edge-up cut that opens up the abdomen of a big game animal. Spine: The blade tang is a rat tail, sometimes referred to as a stick tang. The tang goes all the way through the handle and is secured to the handle with a bolt. 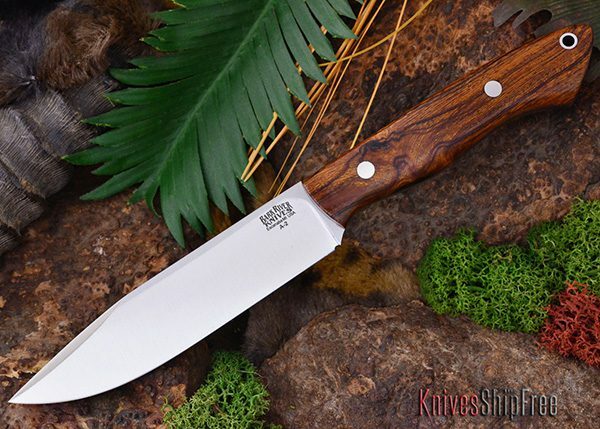 That makes this a full tang knife, which is my preference for any knife that could end up being a survival knife. The handle fits my large hands very comfortably. Handle: My Western had a stacked leather handle, so here was no question what the Manitou would have. The handle is long enough for my large hands, and big enough around that I can get a good handful. I usually wear cut resistant gloves over latex gloves when I’m field dressing a deer or elk, and knife handles have to be big enough to handle the extra bulk from the gloves. The quillon is just right – large enough to keep you hand from sliding onto the blade, but small enough to not affect handling. The aluminum end cap and colored spacers make this a great-looking handle. Stacked leather handles tend to get grippier when your hands are damp. At least that’s what I’ve noticed on my Western. That is one thing I’ll be checking out when I get out in the field. 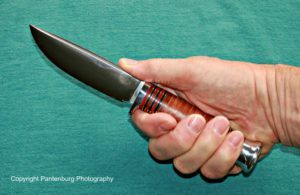 Handling: I’ll have to check that out in the field, but the knife balances right at my index finger. This makes the knife feel very nimble, and makes wood carving easy. Sheath: The Manitou comes with a sturdy leather sheath that protects the edge and the user. It appears to be very similar to the sheath that goes with the Bark River sheath supplied to my Gunny/Bravo 1. And that’s it, so far. Flooding has kept me off the Mississippi River, where I intend to wring out a bunch of knives. And the Big River Wild Adventures wilderness skills school is currently on hold until the islands on the river re-emerge from the high water. 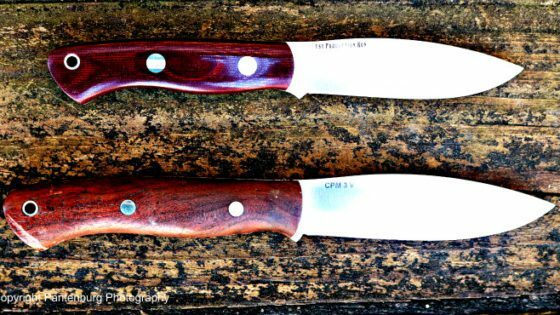 But the weather is getting really nice here down south, and I will be checking out the Manitou and several other excellent knives.